The Grand Army of the Republic mourns for the good and great man who was unanimously elected to the highest honor within it's gift a little more than a year ago in that metropolis of New England, which knew him best, and in which he made for himself a name and a fame that spread from ocean to ocean, wherever love of country and reverence for the flag found an abiding place. But the Grand Army is not alone in its sadness. The death of General Blackmar has stirred the hearts of the Woman's Relief Corps to their innermost depths. A wail of sincere and genuine grief rose on the air from every Corps in every Department when the sorrowful news was flashed over the wires that his great heart had ceased to beat, and his noble soul had been summed by its maker to dwell in bliss for all eternity in that paradise prepared by God for those who have loved him and kept his commandments. He believed firmly in the principle on which our order is founded and he had faith that we exemplified those principles in an honest and a zealous manner and with sincere and unselfish motives. But tears will fail to flow when the fount is dry, and time, nature's own physician, will bring surcease of pain. Then will come reminiscence, and, oh, the sweet sense of consolation that will follow in its train. Then will the mind, looking backward, take pleasure in contemplating the splendid history of General Wilmon W. Blackmar, and will record with peculiar satisfaction each incident in his eventful life, beginning with his birth in the little town of Bristol, Pennsylvania on July 25, 1841. He was fortunate in his parents. His father was a clergymen and a native of Massachusetts and his precepts and example were the chief factors in molding the boy into a man; but the influence of his New Hampshire mother must not be overlooked in his training. She it was who watched over him constantly and directed his steps in the right path, when the father was called from home on ministerial duties. In 1861 Wilmon W. Blackmar was a student in Exeter Academy, Exeter, New Hampshire, where he was preparing for college. There he heard the reverberation of the sound of the first gun fired by the internal enemies of his country. His ire was aroused at the treacherous attack on the nation's life. He left the academy, paid a short visit to his home to obtain the parental blessing and then to Philadelphia, where he enlisted as a private in the Anderson Troop, afterward known as the 15th Pennsylvania Cavalry. From that time until the very end of the war he was in the very whirlpool of the terrible storm that swept over our land. He appear to bear a charmed life, taking part in 22 battles in the Western Army and the Army of the Potomac with being wounded or taken prisoner. He was, however, sick nigh unto death while in the Western Army, and was nursed back to life and strength by a kindhearted woman to he showed his gratitude and friendship up to the day of her death, and he continued that friendship to her children and grandchildren while he lived and left then a substantial legacy when he died. For gallantry at the Battle of Antietam he was promoted Corporal and subsequently served in every noncommissioned grade up to first sergeant of his company until his promotion to a first lieutenancy in Company H, First West Virginia Cavalry. He was mustered out as Sergeant in Chattanooga, TN, and joined his new command in the Army Corps commanded by Sheridan. 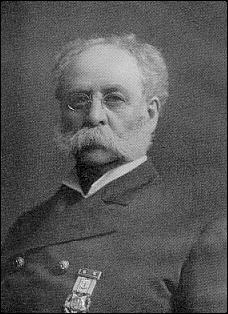 He had scarcely become acquainted with his new companies when he was made Brigade Provost Marshall by Colonel James M. Schoonmaker, the Brigade Commander. Colonel Schoonmaker was the youngest colonel of Cavalry in the Union Army being only 20 years of age. He is now the First Vice-president and General Manage of the Pittsburgh and Erie Railroad and is reckoned among the Pittsburgh millionaires. In 1864 the Colonel commanded a brigade and the Lieutenant was on his staff. In 1904 the Lieutenant commanded a quarter of a million of old soldiers and the Colonel was on his staff. Lt. Blackmar subsequently served as Provost Marshal and Asst. Adj. General on the staffs of Generals Powell and Capehart until the surrender of Lee at Appomattox in 1865. A pathetic incident in connection with General Powell occurred last December, which is worth relating. Commander-in-Chief Blackmar and the national Executive Committee, with their ladies, were in Denver, making arrangements for the 39th Annual Encampment. On their return journey they stopped at St. Louis, MO. General Powell, was mortally ill, and his old staff officer drove out to offer his sympathy to the family, not expecting to be permitted to see him in his feeble condition. Mrs. Powell, after much hesitation, finally said, "General Blackmar, I have been thinking seriously, and I feel that I could never justify myself if I refused to grant a meeting between you and your old General, and so, if you please, I will conduct you to his chamber." They met, the old General lying thin and wan on his bed, his old Provost-Marshall in the prime of life and health standing over him holding his hand. "It is almost over," said Powell, looking up into Blackmar's face. "Nonsense," said Blackmar, "you are on my staff, and I expect you will do good service for me yet." "Commander-in-Chief", replied the sick man, "My days are numbered, I must go, but I will serve you on the other side." A few days afterward, on December 26, the old veteran died. General Blackmar received honorable mention for having, on June 22, 1864, carried to General Crook, at great risk to himself, news of General Powell's precarious position, being outnumbered and almost surrounded by General Early's forces. By this dangerous and voluntary service General Powell's forces was saved. At Five Forks, while on General Capehart's staff, he formed a line and charged over a ditch, driving the Confederate line in disorder. His act was seen by General Custer, who laid a hand on his shoulder, and said, "Well done, Captain!". "I beg your pardon," said Blackmar, "I am only a Lieutenant." "I said Captain, " replied Custer. And the title stood, for there and then our hero was promoted for conspicuous gallantry on the field on battle. When General Grant received the surrender of General Lee in the McLane House, he occupied a chair which was immediately afterwards purchased by General Capehart and confided to the care of Captain Blackmar, who carried it before him on his horse to the brigade wagon. That chair remained in the possession on General Capehart until a short time before his death, when he presented it to General Blackmar, and it has been a conspicuous object in his military den; and in his last will he left to the United States. On July 8, 1865, General Blackmar was mustered out by the reason of the end of the war, and went to Boston, Mass, where he entered the Harvard Law School. There he remained until his graduation and admission to the bar. He remained in Boston and practiced law until a few years ago, when, having amassed a competency, he retired from active practice, and his time since then has been occupied as director in various banks and corporations. When he left the army, he retained his interest in military affairs by serving for 10 years as Judge Advocate General on the staffs of four successive Governors of Massachusetts. He was always active and enthusiastic Grand Army man, having joined John A. Andrew Post 115 in 1867 and being a charter member and first Commander of Edward W. Kinsley Post 113 in 1868. In this post he remained, and from it was elected Jr. Vice-Department Commander of Mass in 1900, Sr. Vice in 1901 and Dept. Commander in 1902. When it was found that the office of Commander-in-Chief was likely to come to Mass., all eyes were turned toward him as the man possessing all the ability and qualifications necessary for the place, and when, the 38th National Encampment was in Boston, only the expected happened when all names were withdrawn and he was unanimously elected to the honorable office. How well and acceptably he filled that office is known to nearly every Department int the Order. While he was ever our pronounced friend, his field was broader and his influence greater during the past year, and he was thus enabled to be more helpful than he been. Those who knew him best, and were most cognizant of his work, will cheerfully testify that he never lost an opportunity to acknowledge the success of the efforts of the Woman's Relief Corps in the cause of Charity and Loyalty, and to implant in the minds of the great public a true knowledge of our virtues and our worth. General Wilmon W. Blackmar's estate was sold a about 10 years ago at auction in Massachusetts.